HealthCare Assistant is an umbrella of health care services available to members and their families. This suite of services was created to ensure our members have the absolute best access to the best health care in the country. To find out what we can do for you, check out the list below. HealthCare Assistant has access to experts to help you. We give you access to health care experts ready to guide you through the entire process, at all times. HealthCare Assistant is provided free to Funding Advantage members by Allied National and their employer. Find the right doctor who specializes in your health condition. Get the best treatment for your specific needs. Receive second opinions from top doctors. Manage any specialty drug you are taking. If you are taking multiple medications, you might be a candidate for DNA testing to help you get the right drug doses and combination. Manage diabetes for a healthy life. Get support with behavioral health issues. 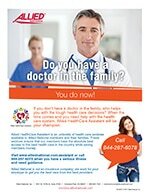 Click the image to the right and download our informational flyer about HealthCare Assistant - a Funding Advantage member's ally. What is Allied HealthCare Assistant?